For fun, here are some stats I compiled about three websites I track: this site you’re reading, a large B2B site, and a large consumer site. They paint an admittedly anecdotal but still encouraging picture of browser versions, Flash, and screen resolution. Don’t write a thesis based on it, but feel free to use the numbers to back up whatever business case you may be pitching to your boss or client. The three sites: my site (www.graphicpush.com), a large corporate site that is primarily B2B, and a large consumer-focused site. My site does not get nearly as many unique visitors as the other two, but I assure you the visitor count for all three is high enough to make this statistically relevant. These numbers are from January 2010. Not unexpected results. My site has a far more progressive user-base because of the type of visitor it attracts. 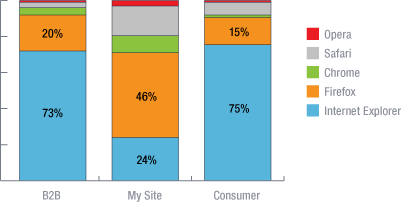 These numbers compare usage of IE between January 2009 (left column) and January 2010 (right column). Several interesting things came from this exercise. First IE 5.5 is virtually non-existent, which is great news. Second, IE8’s growth is encouraging, especially in the consumer sector. Finally, IE6 is holding on like a barnacle to its eroding but stubborn install base; the B2B site, which is largely trafficked during work hours by large businesses, is particularly telling — a lot of companies simply have not upgraded their machines. In the last column, I excluded screen resolutions that were obviously mobile devices — it largely constitutes 800×600, 640×480, and so forth. This is really good news for all the web designers (like me) who build for 1024×768 — your site is being seen by just about everyone. Do with these numbers what you will. I aggregated them more out of curiosity than anything. I am working on a fairly complex site now that uses a lot of jQuery, and we are outright ignoring IE6 users. You are correct in assuming I am ignoring progressive enhancement in this instance — this is by choice, because the functionality is just too good to waste on derelict software.